The number of part-time workers who are college students under age 30 amounted to 2,530,000, according to a report by National Statistical Office in 2011. This indicates that one in five college students are working part-time. Some part-time workers find themselves working under exploiitive employers, which should not be surprising since almost 1,700,000 of those who are working part-time are reportedly not even earning minimum wage. Moreover with part-time status, most of these workers do not have benefits or even time off, paid or not. Furthermore, job security is a big issue as part-time workers can suddenly get fired without any warning or justification. Albayeondae was established on January 2, 2013 as a means to provide help. It is an organization that aims to resolve the problems part-time workers face. The group uses the collective voice of its members to make known the issues that would normally be difficult to express by any individual member. It has coordinated various activities such as conduction street campaigns, providing informative lectures to workers, and interviewing part-time workers who experienced unfair treatment by their employers. 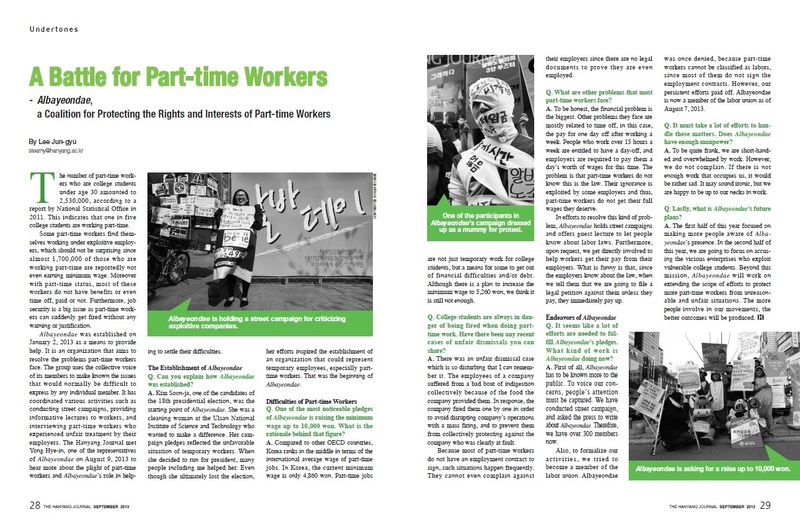 The Hanyang Journal met Yong Hye-in, one of the representatives of Albayeondae on August 9, 2013 to hear more about the plight of part-time workers and Albayeondae’s role in helping to settle their difficulties. Q. Can you explain how Albayeondae was established? A. Kim Soon-ja, one of the candidates of the 18th presidential election, was the starting point of Albayeondae. She was a cleaning woman at the Ulsan National Institute of Science and Technology who wanted to make a difference. Her campaign pledges reflected the unfavorable situation of temporary workers. When she decided to run for president, many people including me helped her. Even though she ultimately lost the election, her efforts inspired the establishment of an organization that could represent temporary employees, especially part-time workers. That was the beginning of Albayeondae. Q. One of the most noticeable pledges of Albayeondae is raising the minimum wage up to 10,000 won. What is the rationale behind that figure? A. Compared to other OECD countries, Korea ranks in the middle in terms of the international average wage of part-time jobs. In Korea, the current minimum wage is only 4,860 won.Part time jobs are not just temporary work for college students, but a means for some to get out of financial difficulties and/or debt. Although there is a plan to increase the minimum wage to 5,260 won, we think it is still not enough. Q. College students are always in danger of being fired when doing part-time work. Have there been any recent cases of unfair dismissals you can share? A. There was an unfair dismissal case which is so disturbing that I can remember it. The employees of a company suffered from a bad bout of indigestion collectively because of the food the company provided them. In response, the company fired them one by one in order to avoid disrupting company’s operations with a mass firing, and to prevent them from collectively protesting against the company who was clearly at fault. Because most of part-time workers do not have an employment contract to sign, such situations happen frequently. They cannot even complain against their employers since there are no legal documents to prove they are even employed. Q. What are other problems that most part-time workers face? A. To be honest, the financial problem is the biggest. Other problems they face are mostly related to time off, in this case, the pay for one day off after working a week. People who work over 15 hours a week are entitled to have a day-off, and employers are required to pay them a day’s worth of wages for this time. The problem is that part-time workers don’t know this is the law. Their ignorance is exploited by some employers and thus part-time workers do not get their full wages they deserve. In efforts to resolve this kind of problem, Albayeondae holds street campaigns and offers guest lecture to let people know about labor laws, Furthermore, upon request, we get directly involved to help workers get their pay from their employers, like those who do not pay for a week’s holiday pay I mentioned. What is funny is that, since the employers know about the law, when we tell them that we are going to file a legal petition against them unless they pay, they immediately pay up. Q. It seems like a lot of efforts are needed to fulfill Albayeondae’s pledges. What kind work is Albayeondae doing now? A. First of all, Albayeondae has to be known more to the public. To voice our concerns, people’s attention must be captured. We have conducted street campaign, and asked the press to write about Albayeondae. Therefore, we have over 300 members now. Q. It must be take a lot of effort to handle these matters. Does Albayeondae have enough manpower? A. To be quite frank, we are short-handed and overwhelmed by work. However, we do not complain. If there is not enough work that occupies us, it would be rather sad. It may sound ironic, but we are happy to be up to our necks in work. Q. Lastly, what is Albayondae’s future plans? A. The first half of this year focused on making more people aware of Albayeondae’s presence. In the second half of this year, we are going to focus on accusing the vicious enterprises who exploit vulnerable college students. Beyond this mission, Albayeondae will work on extending the scope of efforts to protect more part-time workers from unreasonable and unfair situations.